In this article we will give an overview of how to download your data into a spreadsheet, for a specific form. In order for you to do this, your form will have to have a web store. A web store is created by default on creation of a form by an automatic creation of Device Magic Database destination. 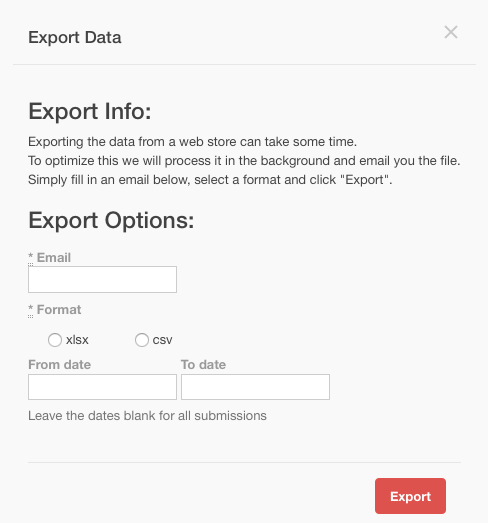 Enter your email address, select your format and select a date range. You will receive an email with a download link for the relevant data, all or date range, you selected. This concludes our overview of how to download some or all of the data from your web store. If you have any questions or comments feel free to send us a message at support@devicemagic.com or leave us a comment below.